It’s the old adage, “Be careful what you wish for, you just may get it.” I was completely satisfied when news began to be presented on the web. Unlike newspapers it was free, and every bit as good. Over the past few years that has changed about as radically as possible. At first the various concerned web sites presented in depth news articles. Along the sides of the sites were sidebars with advertising, but you didn’t have to go to them if you didn’t want to, just like in the newspapers. Then the brilliant ad people started adding movement to the ads which made it nearly impossible to ignore them. At least you didn’t have to put up with that in the newspapers. Then some savvy ad person got another brilliant idea. Why not make the web sites more like TV by adding videos. That way an advertisement video could be added prior to the news segment you wanted to watch, forcing you to watch the ad. Now approximately half of all articles on the supposed news sites are prone to this. Then the ad people found out they could trace everyone’s viewing habits. If you searched for some item, even for a friend, they could inundate you with ads for that item, even though you had no use for it at all. One thing led to another until the ad folks discovered that a great percentage of the viewers were only studying items of prurient interest, or about celebrities. Presto, a great percentage of the items placed on so-called news sites are now only those items. The news, as such, is disappearing. There are several wars being fought all over the world, but hardly a word is to be found about them day after day. No, it is more important that we are spoon fed the latest twerk of Miley Cyrus in place of those mundane things like war and peace. Of course, in order to see that, we have to be entertained with yet another 30 second video about some object nobody wants, much less you. She first saw duty as a part of Admiral Farragut’s blockading squadron off Mobile Bay. On the night of March 14/15, 1863 she and six other ships were ordered to run the Confederate batteries of the Mississippi at Port Hudson. The first two made it up the river. Two others lost steam power and drifted back down the river. Monongahela and Kineo, lashed together, grounded and took a pounding losing 6 men including the Captain, with 21 more wounded. After working loose they again attempted an upriver run only to lose engine power and drifted back downriver. On May 27th, and again on July 7th she fought two more battles on the Mississippi before being sent to Texas waters for aid in capturing the towns of Brazos Santiago and Brownsville between the 2nd and 4th of November. She then returned for duty off Mobile where she remained on duty until the end of the Civil War. While in the West Indies on November 18, 1867 an immense tidal wave was created by an earthquake. The Monongahela happened to be in direct alignment, was raised on a 30’ wave and carried nearly a mile inland on St. Croix Island, where it was set high and dry in an upright position. It took 4 months to get it back in the water. It was then towed to New York City, and thence to Portsmouth. Five years later it was finally seaworthy again and rejoined the Atlantic Fleet in 1873. Six more years of duty found her once more in need of repair so she was decommissioned in 1879. 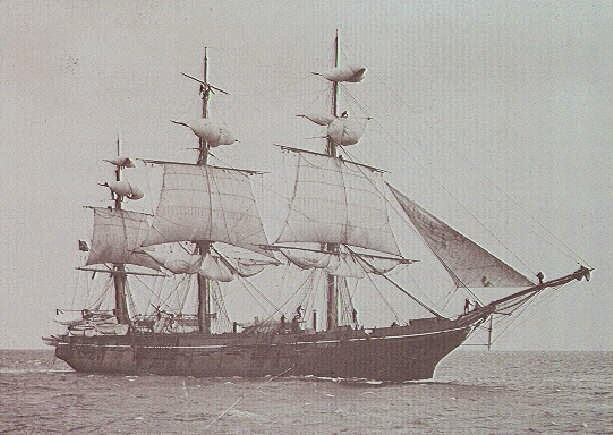 It was in 1883 that she next appeared with all weaponry removed and used as a supply ship. Her rigging had been changed from a Barkentine to a Bark, by re-rigging her mainmast as square. After a short stint off Peru, she rounded South America’s Cape Horn to Portsmouth Navy Yard where she was fitted out as a training ship for the Naval Academy in 1890. She made yearly Academy cruises through 1897, skipped 1898 due to the war with Spain, and made another in 1899. The USS Monongahela then moved on to Newport Rhode Island as a training ship for apprentices. She spent three years in that capacity cruising to Europe and the Caribbean. In 1904 she was detached from that duty and began use as a storeship at Guantanamo Bay, Cuba. On St. Patrick’s Day 1908 the 46-year-old ship was totally destroyed by fire. 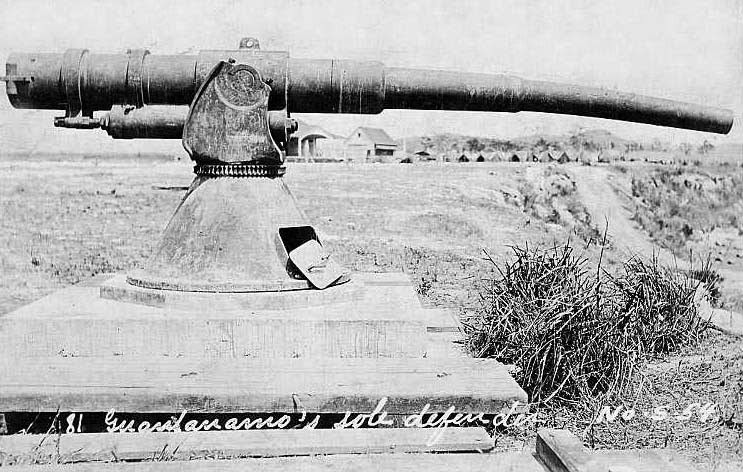 Salvaged from the wreck was a 4” gun that, due to the intense heat, had a warped barrel. It was named “Old Droopy,” and has been on display at Deer Point, Guantanamo Bay Naval Station since then. Launched June 15, 1915 she was turned over to the Navy October 17, 1916. At 608’ long she was 25 feet longer than previous battleships of the U S Navy. Her major armament was four turrets each with triple 14” guns. She left New York City November 10, 1916 for a shakedown cruise. It may have been a premonition of an event 25 years in her future that on December 7, 1916 off Guantanamo Bay, Cuba a stripped turbine forced the super dreadnaught back to New York for a major repair lasting 4 months. On the 8th of February of 1920 she was once more back at Guantanamo Bay, Cuba for fleet training. January 1921 she transited the Panama Canal to join the Pacific Fleet. In 1929 the 14-year-old ship underwent a complete modernization at Norfolk, Virginia lasting until March 1931. During 1934 she returned to the West Coast where she remained for the rest of her career. On December 7, 1941 she was hit with four major bombs in the Japanese attack on Pearl Harbor, Hawaii. This ended the career of USS Arizona as she sank to the bottom of the harbor with the loss of 1177 crew members. The first photo is the Arizona in the waters off Guantanamo Bay, Cub. 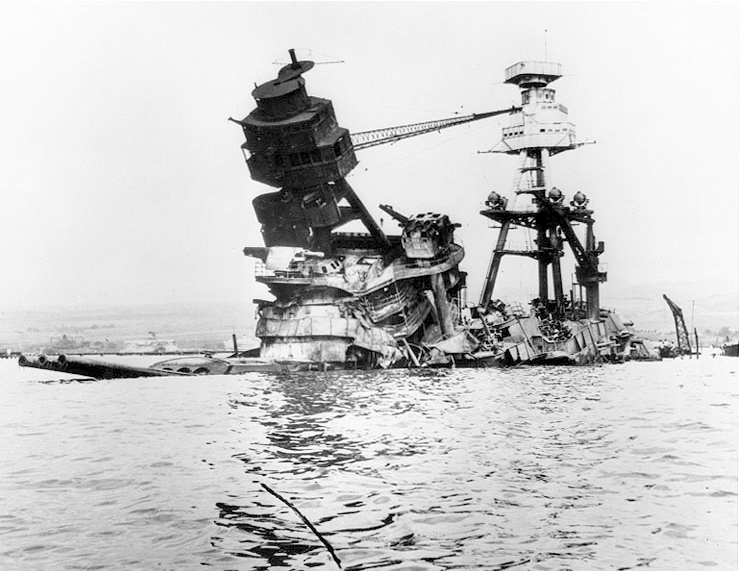 The second photo depicts the Arizona after it had been sunk in Pearl Harbor. 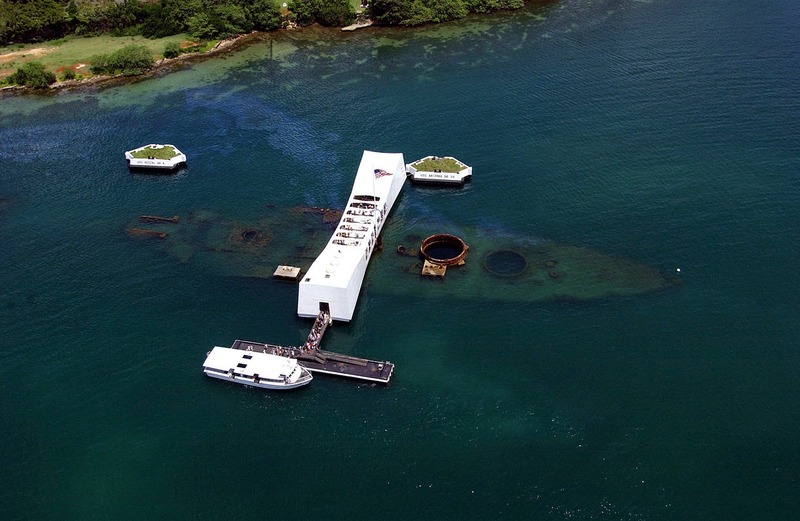 The third photo is the Arizona memorial as it is today. From 1890 when the St. Lawrence State Asylum received its first patients, until about the end of WW II, it was a completely self-sufficient entity complete with its own water supply and electrical generating plant. 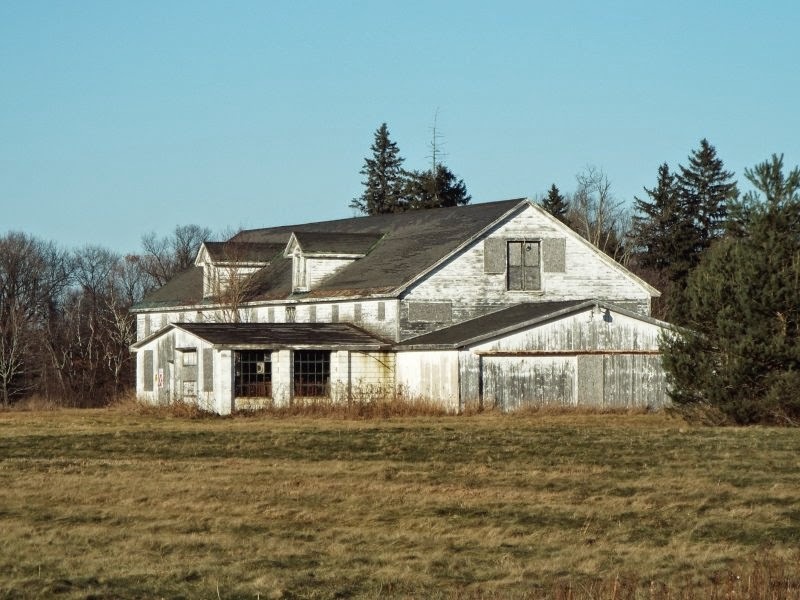 It grew all of its own vegetables, fruits, and meat, as well as operated a canning plant. Surplus milk and livestock, as well as hay and potatoes were sold to the public. There were sewing shops which produced clothing, and shops making brushes, brooms, shoes, and tin ware. A logging operation operated on the hundreds of acres of land owned by the state. It had its own fire department and police force. There was a hospital for the patient’s care, as well as an affiliated school of nursing. A library was maintained. After the war returning veterans, among others, began to overburden the complete state mental health system. 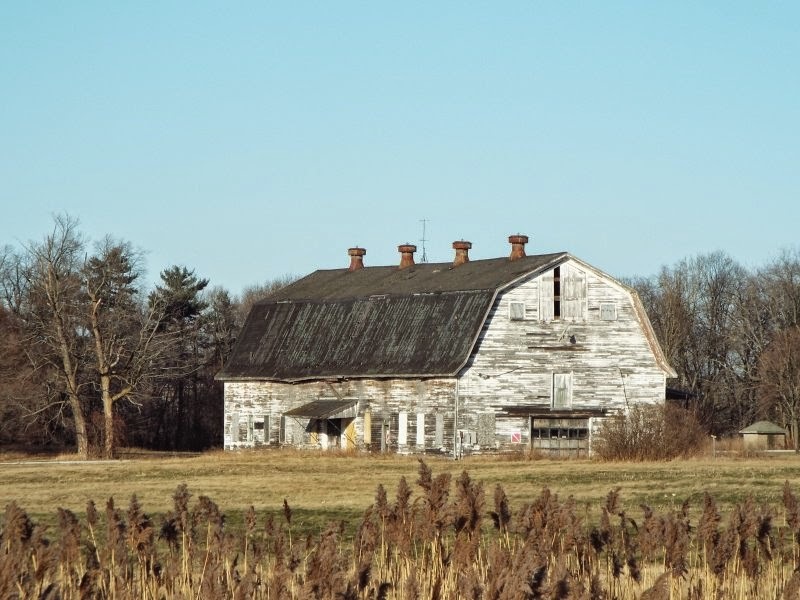 Due to this, and other causes, the entire farm operation ceased operation in 1959. Some of the buildings associated with this operation yet stand after 55 years of disuse although they are deteriorating with no upkeep. It will be but a few more years until they are gone from this once thriving business. These buildings yet survive among the newer modern brick and mortar specimens. Josh Ferrin's hands trembled as he fumbled for the phone. He started pacing the floor. He was so giddy from joy that when his wife answered, he choked on his first words. "Tara," he blurted, "you're never going to believe this... "
Finding $45,000 in his new home changed Josh Ferrin's life, but not the way he first imagined. Ferrin had just discovered $45,000 stashed in his new home. There's a biblical parable about a man who found treasure hidden in a field. Ferrin found his in a dusty attic. For years, the author and illustrator had wondered what would happen if he struck it big. Would sudden wealth change him? Three years ago, Ferrin got his answer. His story began one Wednesday in May, when Ferrin was miserable. He was suffering from pneumonia and had been forced to take time off from his job as an artist at the Deseret News in Salt Lake City. But things were looking up. He and his wife had just closed on their first house, and Ferrin decided to take a private tour after getting the keys. Ferrin moseyed back to the garage, where he noticed something odd: a scrap of carpet dangling from an opening in the ceiling. Grabbing a ladder, Ferrin tugged on the carpet and pulled back a celling panel leading to an attic. When he climbed into the attic, Ferrin saw eight World War II-era ammunition boxes. He delicately pried one open, dreading seeing a grenade. Instead what he saw blew his mind: wads of bills held together by orange fishing twine. He started counting -- and kept counting until he eventually realized he had stumbled onto $45,000. He called his wife, already envisioning how they could use the cash: remodel their new house, repair their car, maybe even adopt. But her first response chilled those plans. She told him to call the family who previously owned the house. "I immediately knew she was right," Ferrin said. "As much as I wanted to keep it, I couldn't keep it. That just wouldn't be right." The previous owner was Arnold Bangerter, a biologist with the Utah fish and wildlife department and a father of six. His wife had died in 2005, and after Bangerter died in 2010 his children sold the house to the Ferrins. It turned out Bangerter had been squirreling away money for years; some of the bills dated back to the 1970s. Ferrin contacted Bangerter's children and gave them all the money. Before he did, though, he had a little fun. He photographed his two boys, Lincoln, 10, and Oliver, 7, throwing piles of cash up in the air while he yelled it was raining money. Not everyone thought it was a laughing matter to give back so much cash. Some people told Ferrin he should have kept the money, that he had a legal right to it because he found it in his home. For Ferrin, something could be legal, but that didn't make it ethical. How could he keep money intended for someone else? "We always wonder to ourselves, if I struck it big would it change me?" he said. "Would I be a different person? It was hard to hand over ($45,000), but it was the right thing to do." What sealed Farrin's decision, though, wasn't ethics; it was fatherhood. Ferrin thought about the devotion Bangerter had for his children, and he saw a kindred spirit. "I imagined this guy, for years and years, collecting money and putting it away. I understand that need to think for the future and take care of loved ones. I can understand him as a dad." I didn't want to be the guy who found something and kept something secretly. Ferrin said he, too, is trying to leave something for his children as they grow up. "There's a big world out there and I try to teach them to be good young men," he said. "Sometimes I come short of that. They'll forget about all the lectures I gave them. But I think they will remember this one." Ferrin left the Deseret News but is still an artist. He draws political caricatures and whimsical children's illustrations and has written a book, "Blitz Kids," about his grandfather's role with the University of Utah's improbable basketball championship team in 1944. Ferrin's art and his book, however, are not just a means to earn a living. "It's my attempt to establish a legacy that will last beyond me," Ferrin said. Now Ferrin's deed is part of that legacy. News of his selfless act spread across the globe. His story is preserved online. He has received letters from around the world. One guy in Australia said he would be honored to buy him a beer. Another person sent him a pocket knife with the engraving, "Honesty has its own rewards." Ferrin had to stop granting interviews after a while because it became too much. He says today that what he gained from giving away his treasure is more than what he found. "It was one of those moments that test your character," Ferrin said. "We are the sum total of our decisions. I didn't want to be the guy who found something and kept something secretly. I don't regret it at all. It made me a better person." 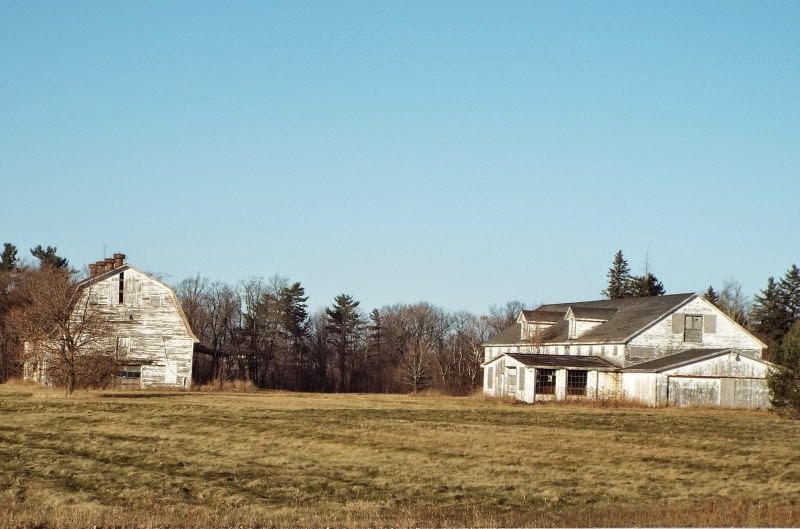 A family raised their children in a home, and after they were grown and left, the old couple remained there. One day the wife died, followed by the husband five years later. With none of their six children caring about the home they were raised in, it was sold to a stranger. The new owner discovered $45,000 hidden in the home. After some thought he contacted the children of the former home owners, and gave them the money as the morally right thing. People from around the world have agreed with his act, hailing him as a hero. I question that decision. The elderly former home owners could easily have given that money to their children at any time they deemed it the right thing to do. They obviously chose not to do that. After his wife died the father had yet five additional years to contemplate that same decision. He still chose not to give the money to his children. It is unlikely to ever be established why the elderly couple, or the father alone, chose not to give the money to the children, but it remains that was the choice. Why then, was it the moral responsibility of the new home owner to do what the children’s own parents had refused to do?